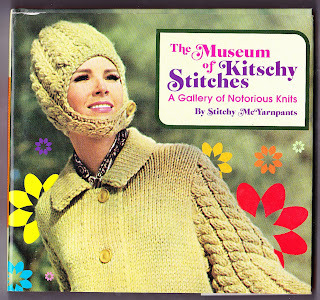 The Museum of Kitschy Stitches : A Gallery of Notorious Knits by Stitchy McYarnpants (Debbie Brisson) is a book compiled from "vintage catalogues, patterns and advertisements" by a self-confessed "master of fashion disaster". I think we can safely assume that the photographic likenesses contained therein date from the `60s to early `70s. I presume the vibrant (is that the right word ?) colours were a reflection of the optimism of the area. 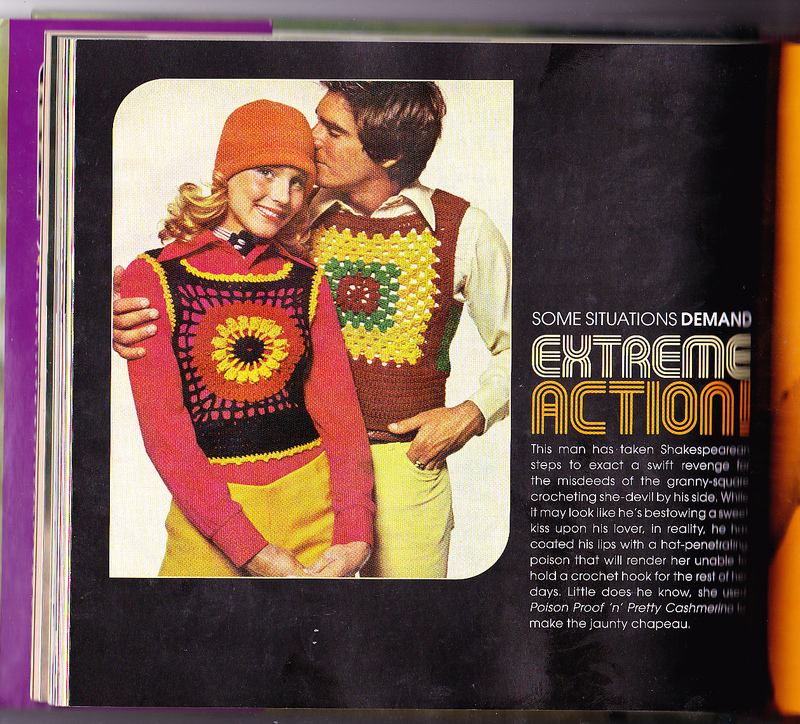 The actual styles, however, can only be the symptoms of some kind of clinical condition. Did people really look like that ? If so, why ? 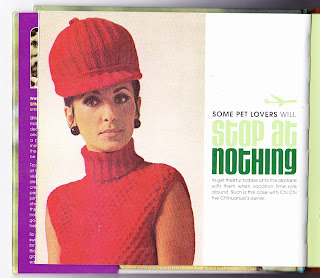 My best guess is that it was some sort of crime prevention exercise - dressed like that, people would rarely leave home, let alone get involved in any activity that might draw attention to them. 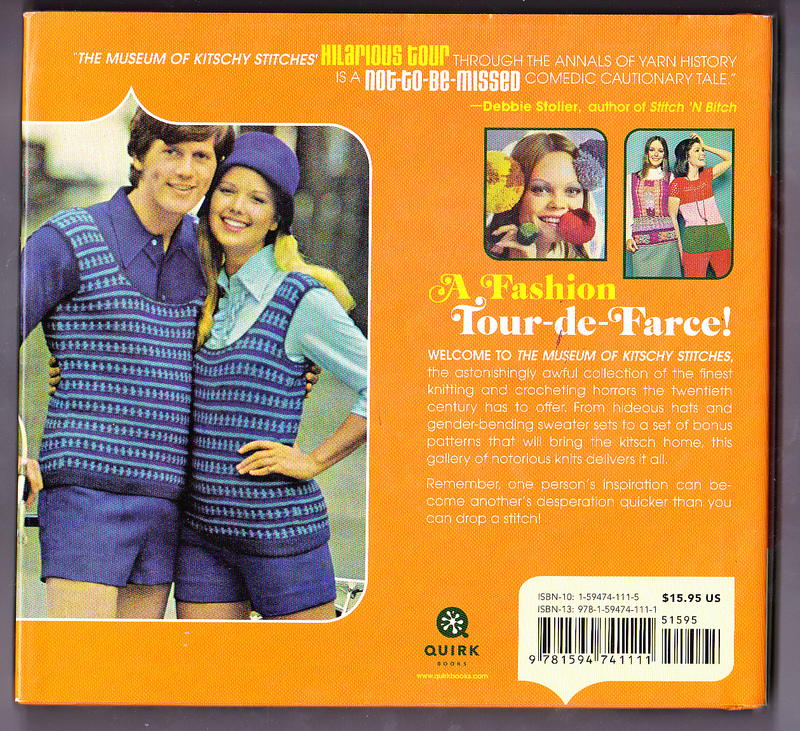 On a personal note, I recall as a child that my mother would occasionally nod towards people passing by and comment jokingly "promise me you`ll never dress like that." At the time her sense of humour went over my head, but now after all these years, I see what she was getting at ! Anyway, a selection of the relevant fashions is reproduced here for you to savour. These are just a few of the more tasteful examples - I was worried some of the others could cause nightmares to those of a sensitive disposition ! If you are unwise enough to require a copy of the book, it is number 3802 in our listings and should appear online within the next twelve hours.